Hurricane Spin Mop® | Official Site | The Mop That Spins Away Dirt! The Mop That Spins Away Dirt! Cleans practically anything and everything. Clean Any Mess On Any Surface Without Touching A Dirty Mop! Utilizing 360° rotating action, Hurricane Spin Mop® swivels around furniture, baseboards, and corners easily. Hurricane Spin Mop® has a machine washable head so you donâ€™t waste money on replacements. Get off your hands and knees and say hello to the Hurricane Spin Mop®! Finally, there's a floor cleaning system that cleans practically anything and everything. Hurricane Spin Mop® uses patented centrifugal spinning technology so you're using a clean mop to give your floors the ultimate clean. READ FULL DESCRIPTION Thanks to the reusable mop head, thirsty microfiber fingers absorb almost anything. Never touch a dirty mop with your hands again! 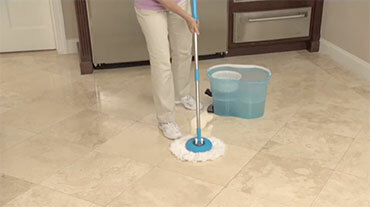 The Hurricane mop is the only mop that uses 360° of rotating action to clean and polish. It easy works against baseboards without scratching, and maneuvers around and under furniture so you'll never have to bend over while mopping. Spin Mop easily picks up messes in one sweeping motion. And it won't leave a nasty trail in its wake. Plus, it works on all surfaces. Easily transition from laminate to hardwood. Hurricane Spin Mop® is so easy to use. When your mop gets dirty, dip into the washer side. Then, place the clean mop in the dryer side and push on the pedal. Nearly all the liquid spins out of leaving you with a clean mop head. The revolutionary bucket has dual pour spouts and can hold super hot water and your favorite cleaning solution. The microfiber mop head is machine washable and dryable. You won't needlessly waste money on disposable refills. Harness the power of Hurricane Spin Mop®! Get your Hurricane Spin Mop® cleaning system now for only two easy payments of $19.99 plus $12.99 shipping handling (conveniently added to your first payment). Your Hurricane Spin Mop® cleaning system includes the lightweight mop handle, super absorbent microfiber mop head, and patented centrifugal spinning mop bucket. But wait! That's not all! Double your offer and receive a SECOND Hurricane Spin Mop® cleaning system AND the mop bucket dolly. Just pay a separate fee of $19.99. Backed by a 10-year guarantee, you have nothing to lose. Order now and cut your cleaning time in half! Hurricane Spin Mop® Has Thirsty Microfiber Fingers That Absorb 10x Their Weight! Order the Hurricane Spin Mop with the for just two easy payments of $19.99 plus $12.99 shipping and handling, conveniently added to your first payment. We are also including an opportunity to add the *SPECIAL OFFER second Hurricane Spin Mop plus the mop bucket dolly for a *Separate Fee of just $19.99. This special Hurricane Spin Mop offer is not available in stores so the only way to get it is to place your order now!